Here is a quick followup post to my previous note on Wallpapers. Yesterday I told you that the Wallpapers app in Chrome OS now has a new “Dessert” category. 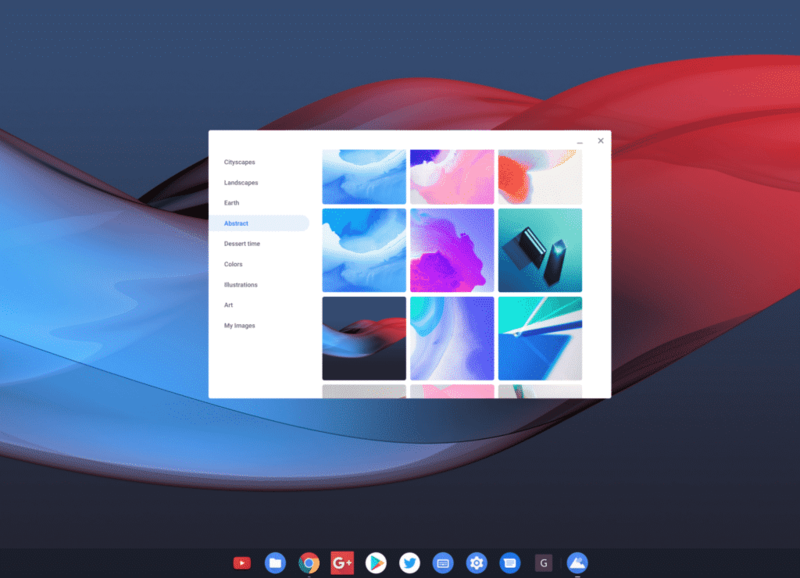 Today, I can tell you that the Default wallpaper from Pixel Slate is now available for all Chrome OS devices. Kellyn Delgado, one of our readers, spotted this on his Chromebook, a Samsung Chromebook Pro. I was able to verify this on my Pixebook, which is on Canary channel. However, I do not think this is Canary only. Another user, HERRYAN SYAH TUPAN SURIAN mentioned in the same post that he has the new wallpaper app on his Acer Chromebook Spin 11 with Chrome OS 70, Stable channel. If you have the new Wallpaper app, which is similar to that on Android, on your Chromebook, you should see this new category. The new category which contains the Slate default wallpaper is called “Abstract”. There are few more wallpapers in this category and you can enable the “Daily Refresh” option to use all of them.